Beginning the green juice journey isn’t always easy. A question I often receive is “what green juice recipes would you recommend for a beginner who doesn’t eat vegetables?” Using this question as a guide, I decided to create five easy and delicious green juice recipes for beginners. These recipes are tailored to be more pleasing to the palate and still provide you with the important nutrient from dark leafy greens. Spinach is among the top healthiest vegetables, loaded with a full spectrum of vitamins and minerals along with anti-inflammatory and anti-cancer properties. Spinach Nutrition: Vitamin K, Vitamin A (Beta-Carotene), Manganese, Folate, Iron, Vitamin C, Vitamin B-complex, Calcium, Potassium, Tryptophan, Vitamin E, Copper, Protein & Zinc. Kale is one of the most nutrient dense foods. Some of it’s health benefits include immune boosting, cardiovascular support, skin-healing, bone-building, aids in detoxification and loaded with anti-cancer nutrients. Kale nutritional properties have been shown to lower your risk of at least five different types of cancer, which include cancer of the bladder, breast, colon, ovary, and prostate. There are at least 4 different kale varieties sold in grocery stores, include all varieties in your diet. Eat more kale and drink more kale! Pineapple is known for the alkaline substance bromelain, which aids in digestion and is linked to a reduction of inflammation in arthritis and other inflammatory disorders. Apples are an excellent addition to any juice recipe. Not only do they make a great base for your juices, they contain many health properties from vitamins, minerals and malic acid to detoxification benefits, digestion aid, cholesterol lowering and improved condition of the skin. There are some many varieties of apples to try, some of my favorite are fujis, galas and pink lady apples. Red Delicious tend to have a lot more sugar, where as the Granny Smith variety is one that has lower sugar content. Cucumbers high water content and mineral balance hydrates your body down to the cellular level. Cucumbers top three phytonutrients are s are cucurbitacins, lignans, and flavonoids. These specific phytonutrients provides out bodies with antioxidant, anti-inflammatory, and anti-cancer benefits. Cucumber Nutrition: Vitamin K, Molybdenum, Vitamin C, Potassium, Manganese, Magnesium & Tryptophan. Last but not least, this green juice recipe features two important herbs you should include in your diet, cilantro and basil. Cilantro contain antibacterial and ant-fungal compounds that have been shown effective against salmonella. Cilantro is widely know for its heavy metal cleansing properties, but cilantro also supports cardiovascular health, contains anti-diabetic properties, anti-anxiety effects, blood sugar lowering effects and antioxidant properties. Basil also offer antibacterial properties, cardiovascular health benefits, anti-inflammatory effects, and DNA cell protection. Basil Nutrition: Vitamin K, Iron, Calcium, Vitamin A ( beta-carotene), Manganese, Tryptophan, Vitamin B6, Magnesium, Vitamin C and Potassium. *Each juice recipe produces 18-20 oz of juice. If you’re new here or new to juicing and are struggling or need questions answered, share them down below in the comments section. If you know someone that may be interested in juicing and incorporating liquid nutrition into their diet, feel free to send them this article. I do not have a juicer can I just do these in a blender? You can. You’ll need to get a fine mesh strainer to strain the juice. Do you have to put some kind of liquid in it m? Is water fine? I've never juiced in my life. I have baby spinach, blueberries, a cucumber, an orange, an apple, a lemon some bananas, Can I make something with that? How much of each ingredient? How much liquid? Can I add ice? any ideas on a good Broccoli and red Cabbage juice? Can you freeze your juices to make them last longer? hi i'm new to all this juicing do you need to add water to the recipes ? Start with one serving a day. Feel free to increase a week later basis on how your body feels. I am starting day 4. Feeling great!!! When will the cravings for "food" stop? Habit or craving? My mom, my sister and I want to start juicing. My mom is diabetic,has high blood presure , and sufers from migranes. My sister is starting to get migranes and joint pain. I have sleep apnia, am overweight, and sufer from horrible head aches. we would love to join your 30 day challenge ASAP. Should we consult our family doctor before starting? Always consult with your family doctor. Hi do you have recipes that include papaya? Michèle Parent Consume RAW MILK OR RAW CHEESES. I make my own KEFIR. All the living enzymes are well and alive in raw. They alone digest the problematic causes creating lactose intolerance. It is in the processing of dairy by sick food corporations that pasteurize and homogenize for SHELF LIFE that makes you and tens of millions intolerant. Death to all enzymes is the result of the pasteurization and homogenization processes. High heat KILLS LIFE. Not done for the lie of "safety" to the consumer. Done to extend shelf life to steal your money and leave you malnourished. Better than nothing, but you are worth investing in a juicer. Short on money, buy the Omega 8 for approx. $300. I "Invested" in my holistic life and bought the SUPER ANGEL 5500…all stainless steel juice extractor. You need a slow juicer that chews the liquid from the plants for max bioavailable nutrition. Do NOT CHEAT YOURSELF. A top quality juicer (not centrifugal) will keep you out of the AMA drugging doctors offices. You MUST BE YOUR OWN DOCTOR. Experts recommend rotating greens and not sticking with certain type of greens or fruit. I don't think a small amount would hurt. halve the juice recipe if you don't have someone to share with – add 1/2 cup water to the juice recipe – put leafy stuff at the bottom and heavier stuff on top – you may have to stop once or twice to push stuff down with a spatula – blend about 30 seconds on low and 30 seconds on high – drink fluffy and pulpy (like I've been doing) or strain with any of the following: nut milk bag, jelly strainer bag (from http://www.marinmamacooks.com/2012/09/how-to-make-a-mean-green-juice-without-a-juicer/), or whatever fine-mesh strainer you have at home plus something to mash it against the strainer with (I've heard this last one is a time-consuming method though). Thank you so much for these beginner recipies! I don't own a juicer yet, but learned on another website that I can create them in my blender by adding a 1/2 C. (120 ml) of water and then straining. I forgot to pick up the straining bags, so tried them just fully blended, and they're delicious! I've tried #1 Sweet Cucumber and #5 Green Juice so far (although I have so much spinach at the moment, I've been adding a bit of spinach to my Green Juice "smoothie"). If you attempt blending without straining like me, be forewarded that it makes more than 2 large pint-glasses worth, so unless your significant other will split it with you, halve the recipe. Unlike juicing, blended veggies need to be consumed immediately, otherwise they taste bad (oxidation I think was the reason). Again, thank you Miriam for these recipies and your wonderfully informative website. Blessings to you! Look up oil pulling as well. Sounds weird but it's pretty cool and helps drain all the unwanted mucus and help with asthma. Juicing is awesome too so make sure to do both. if you drink or eat anything with lactose, you may be intolerant as I was. Any food allergies can cause you this or gut issues. I went paleo, started juicing and oil pulling, and i'm starting to feel normal again! However the few times I have tired to juice fresh raw spinach, I always end up with this “goey-slimy” thing that is quite visually hard to appreciate. Is there any thing i can add to the spinach to break or take away the slime? I use a masticating juicer and I often combine it with beetroot or carrot. Try to juice a few at a time and follow with a hardy fruit like apples or vegetable like carrots and beets. The baby spinach tend to do that more than the full bunches. I’m alergic to apples. what can i Substitute with? 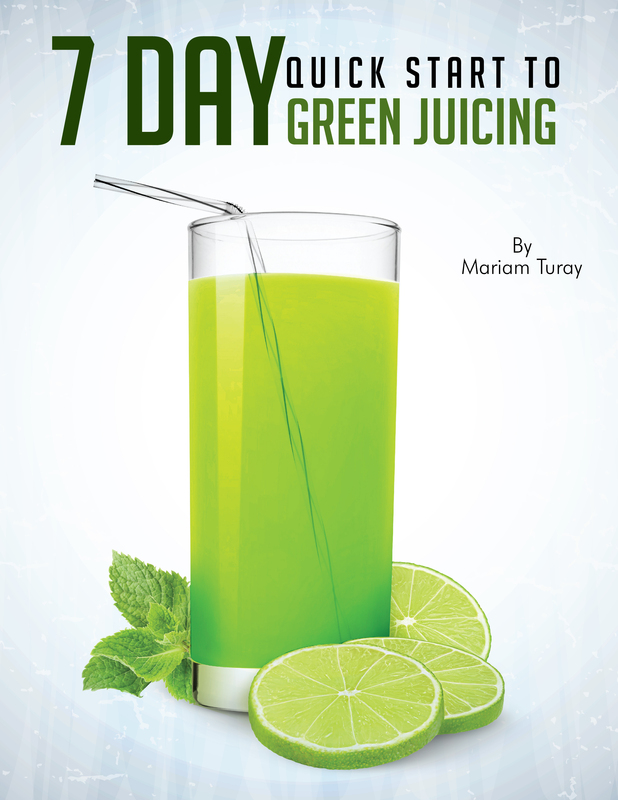 We already do green smoothies daily…..whats the benefit of juicing over smoothies? With juices you are getting the liquid and not the indigestible fibers from the fruits and vegetables. Juicing provides rapid nutrients to our cells. Our body is able to absorb these minerals and nutrients without the need to breakdown and digest bulky fibers. Energy is not required to process these nutrients when juiced. The body can assimilate these nutrients from the juice in a matter of minutes instead of hours. Hi I don't have a juicer only a blender how can I make that work ??? Try these recipes with them. The first one is simple and taste like apple juice, but loaded with nutrients. Also make juicing fun, have them help you prep or juice. I am new to juicing and would love to start using some of your recipes. What I would like to know is should I drink juice with meals or just drink juice only I Would like to lose weight, also I’m diabetic. Always drink your juice before a meal. Your body will be able to absorb the nutrients better. 15-20 mins before a meal or 1-2 hours after a meal. Are the above juice recipes suited for a juicer or blender? I find when I use my juicer all the spinach (even banana) goes into the container where the pulp is collected? Would you suggest I use my blender when using items such as spinach/kale etc? Fruits and vegetables are not high in calorie, so no need to worry. Just watch the amount of sweet fruits you add to your juices. Haven’t started any juicing yet. I’m looking for a juice to help target my many medicals issues. diabetes, high blood pressure, and now way to much proteen in my urine with the strong posibilty leading to kidney desease. Where do I start , I do own a ninja blenda for now. Hi Mariam, I am glad that I found your website. I made sweet cucumber juice and it was divine. Even I am having the green juice for first time in my life and I really liked it. I heard that if you are beginner than you will not like it. but your juice recipes are perfect for new bees like me. Thank you very much and keep up the good work, God bless you. Welcome. Glad you enjoyed it. Hi – my husband & I are new to juicing – we would love to juice to help weight loss – could you recommend some combinations please? We have been having fruit (mainly) but I think we need to have green to achieve our weight loss goal. How often should we juice & can we mix these with other meals or must we go totally juice?? Hi Mariam, how do I preserve these juices? You can store them in mason jars –> http://amzn.to/130r9DM , depending on your juicer they can keep up to 3 days refrigerated. If you’re planning to refrigerate, fill your juices to the top, leaving little to no air. Another option is freezing. Once your juice is made, put them in the freezer immediately. I’m not a medical doctor, so I can’t give you any sort of medical recommendation. But below are a couple of juice ideas to improve overall well-being and are lower in sugar. Excellent recipes. Pure, simple and tasty. Thank you. Hey, I'd like to drink more juices daily, what is the significance to losing weight and juicing properly? How many times a day? Week? Should I switch up my juices daily? Weekly? Monthly? Experiment, there's not just one specific way. You'll have to try it out and see what works best for you. I have recently been diagnosed with early stages of Leukemia. I am being treated naturally and have chosen not to do Chemo and Radiation. My doctor suggested I start juicing immediately and I’m like the Hornbeck’s above … overwhelmed! However I started with a recipe from your site – Mean Green Juice and I didn’t think it was all that bad. I did make enough for two days and stored into the refrigerator due to schedule. Do you have any other recommendations for fighting Leukemia? Thank you as I’m appreciative of the help along the way. Thanks for these recipes I shall be trying each and every one of them. Let me know how you like these. Thank you for keeping the juicing up, I know you'll find you perfect combo. Thank you so much for this article- and also for replying to my personal post. Although my husband and I are excited and eager to become "juicers", we are equally overwhelmed 😉 Thanks for the support! You're welcome. Let me know how it all goes. If you have additional questions along the way, just ask.